The Daily Caller has found that Obama had attended the first of Raddatz's three weddings, back in 1991—he was a Harvard Law classmate of groom Julius Genachowski, who he later named to head the FCC. But the LA Times is not impressed, writing snarkily that "most of us in the political press have become far too complacent to backtrack even one wedding into the past of the debate moderators." Everyone is expecting Biden to come out swinging. One Biden staffer tells Politico that the VP is "eager to draw the contrast—and very capable of doing so." Ryan himself told a radio station yesterday that he expects Biden to come at him like a "cannonball," according to USA Today. 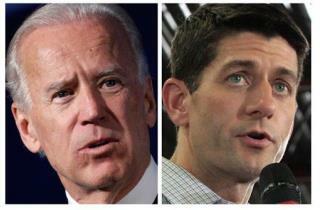 Expect Biden to go on the attack when it comes to Ryan's Medicare plan in particular. CNN also wonders if Biden will bring up Social Security. Ryan has advocated moving the funds into private investment accounts, an idea Democrats usually attack profitably—but Obama appeared to take it off the table in the first debate, saying he suspected he and Romney had "a somewhat similar position." Ryan's team also expects Biden to bring up Romney's 47% gaffe, and they tell the Wall Street Journal that they've specifically been prepping a response to it. On Ryan's end, everyone's wondering just how wonkish he'll be. CNN worries he'll get "bogged down in arithmetic," but Politico suspects it could be his "greatest asset, a rope-a-dope tactic that will take voters into the policy weeds." Of course, all this sound and fury might not signify much. "By tradition, the vice presidential debates have been like the vice presidency itself: well-publicized but largely inconsequential," quips the Washington Post, noting that Gallup studies found they'd never had a significant impact on the race. Oooops! newser WRONG Headline: Intended to be: Watch for Biden to Come Out Smiling. LOL Is them some white teeth or what he showcased. New dentures for the debate I guess...huh? If the Master Gaffer comes out swinging I am sure he will his shoe will be inserted in his huge mouth. How messed up is your game plan when Biden is your Ace in the hole?